Tanjung Waste Bank in Grogol Urban Village, Grogol Petamburan, West Jakarta is officially operated, Wednesday (8/2). It is set up on Jalan Semeru I, RT 13/RW 07.
" 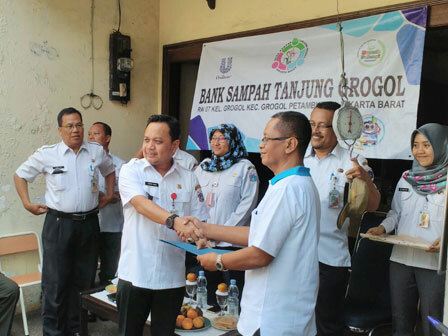 Even, a number of schools and campuses in Grogol Petamburan also already have waste bank"
Grogol Petamburan Sub-district Head, Achmad Sajidin said, all urban villages in his region already has waste bank. "Even, a number of schools and campuses in Grogol Petamburan also already have waste bank," he expressed, Wednesday (8/2). He targets all RWs that spread in seven urban villages to have one waste bank. "We continue to set up waste bank in each RW thus waste volume picked up to Bantar Gebang Landfill can be reduced," he stated. Grogol Urban Village Head, Henni Agustini added, Tanjung Waste Bank already has 96 customers consist of RT/RW caretakers, PKK cadres, Jumantik cadres, PPSU, hotel managers and restaurants.